Johannes A. van der Ven’s Formation of the Moral Self arises as a response to the widespread concerns about deterioration of the moral fabric of Western society. The questions which reveal this instability include: What is good? What is right? What is wise? What is purposive? Van der Ven’s intention is not to offer definitive resolution to these questions, or to quell the tumult of concern, but to direct this energy into a discussion of the various modes of moral education, their merits and shortcomings, and lift up his preferred approach. Ricoeur who provides a way of negotiating these and an additional category: the wise. Ricoeur’s model, which van der Ven takes as foundational for his study, envisions a three-phase model of discernment in which the good is the starting point—an individual determines what is good for him or her. Next, this individual good must be “scrutinized, evaluated, and if necessary, purified by putting them before the judge of justice and passing them through the ‘sieve of the right’” (9). Once this is accomplished, the purified good is applied in the concrete situation, considered in its singularity, fragility and tragedy. This situation-specific application, or practical-moral wisdom is called the wise. After arguing that “morality within religion can be and should be brought to the forum of human rationality” (21), van der Ven lays out five educational paradigms. 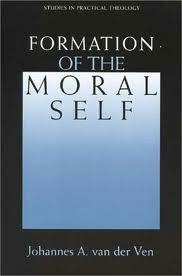 Individualism focuses on the “emotions, motives, attitudes, virtues” and decisions of the individual (21). Communitarianism attends to the “bonds, ties, and relations” between the individual and others (22). Instituionalism launches moral thinking from consideration of the larger society and its institutions. Pluralism highlights the multiple moralities in Western culture and multiculturalism draws attention to the moral diversity even beyond the West. Eschewing all these paradigms van der Ven opts for interactionism which is “an attempt to combine the two poles of human existence: the pole of the individual and the pole of community and society” (29). Van der Ven establishes moral communication, which he defines as “the process of moral exchange and understanding in the search of truth” (35), as the common denominator between the seven modes of moral education he surveys. Among these modes, five are formal (they occur within an organization whose aim is moral formation) and two are informal (they take place constantly in relations with family and the larger society). The informal modes are discipline and socialization. Transmission, development, clarification, and emotional formation are the formal modes. Van der Ven describes and evaluates each mode. Discipline aims at developing the ability to perform desired actions routinely through habituation and self-regulation but the desired and possible actions are muddled by the diversity and complexity of specific situations. Socialization is the “comprehensive and consistent induction of the individual” into “the world of moral meaning” and concurrent roles (87). Sadly, it avoids people being “confronted with the singularity, contingency, and tragedy of concrete moral situations” and “prevent[s] them from gaining an understanding of what real life and morality are all about (124). Transmission attempts to pass on the moral knowledge, affections and desires of a tradition but leaves open the question of which tradition (131) and is thus “not able to solve the problems raised by moral plurality, but actually heightens them” (128). Development posits stages of moral thought ala Kohlberg and seeks to move people forward but fails address many arenas of life and to “take into account the dialectical connection between justice and love” (223). Value clarification seeks to let the student discover their own value system but must address the problems that arise when students of different cultures clarify and express their values (277). Emotional formation seeks to develop healthy self-confidence, trust, empathy, sympathy, justice-sense, shame, guilt and love through observation, experience and concept and while “a very important mode in moral education” (337) easily becomes manipulative. Van der Ven’s final chapter articulates his preferred mode, education for character, which “is the highest objective of moral education” (40). This mode is virtue-based but rejects “the attributes of the traditional approach in this area” (379). The diversity of situations mean that virtues and character are not “fixed” but “open.” As such, the virtue of practical wisdom-in-situation is required to navigate the “paradoxes and aporias that virtuous character is subject to” (379) that pit self-concern against other-concern, care for the loved one against care for the foreign other and the short way of love against the long way. These paradoxes are the fate of the virtuous who choose humbly, attest to their reasons, and wait in “eschatological reservation” to be judged.